Hackensack H.S., Class of 61. Robert was married in Nov. 1965 to a Hasbrouck Hts girl, class if 64. In less than two months, he answered his Countrys call and left for Parris Island, South Carolina in early January. From Boot Camp to his arrival in Vietnam, Robert probably had no more than two to four weeks leave to say good-bye to his family. While in training, his wife joined him and lived in a trailer, outside Camp Lejeune, North Carolina. When Robert left for Schools Battalion and then Staging Battalion, his wife returned to Hasbrouck Heights to be with her family and wait for word from her husband. While on patrol in the vicinity of La Tho Bac (3) Hamlet, Quang Nam Province in search for the body of his close friend, Bobs third platoon engaged in a firefight with elements of the Viet Cong. During this confrontation Bob was mortally wounded by small arms fire and was instantly killed. As stated in a letter to Bobs parents, Capt. 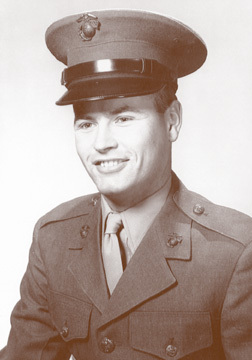 T. M. Pratt, company commander, wrote, "Your son was held in high esteem by his fellow Marines and he will be keenly missed by all who knew him. He was an outstanding Marine and a credit to his Country and Corps". In all his correspondence to his family, Bob never complained and never let on the difficulty or the dangers of the War. Instead, he requested the family send him candy to distribute to the children of this war torn land. Robert was survived by his wife of 12 months, both parents, a brother and three sisters. Played in the 1964 Cotton Bowl for the National Championship vs. Texas as the starting linebacker. Accounted for 12 unassisted tackles. The quarterback of that team was Roger Staubach. Operation Kern, promoted to Exec. Officer of Golf Co. While his former 1st platoon was pinned down by heavy volume of automatic weapons fire, 1st Lt. Holden led 3rd platoon to aid the 1st, against the wishes of the Company C.O. Lt. Holden conspicuously exposed himself to enemy fire while directing 3rd Platoons base of fire. Upon learning that the 1st Platoon Commander and Sergeant were wounded, Lt. Holden took over command to extract the 1st Platoon. While attempting to gain superiority and attack the enemy, Lt. Holden, fell mortally wounded by a single round through his heart. "I was with Tom when he decided to become an infantry officer in the Marine Corps. 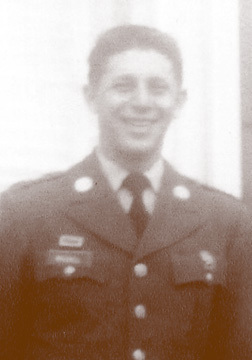 He knew that war was coming in Vietnam and he rightfully felt that he would best be able to serve his country and the Corps as an infantry platoon commander. Once in combat, he proved the wisdom of that decision. Tom was an inspired combat leader  one of the best. His men loved him. Your letter inspired me to reread the documents that chronicled his courage and leadership under fire during his 10 months in Vietnam. In doing so, I was deeply moved. In the true sense, Tom Holden was a man of honor, of courage and of commitment." His fellow soldiers unanimously agree that Mike never complained and never shirked his responsibility or tried to get out of work. He was always ready, willing and able. Mikes favorite saying, "Let it ride", was unanimously adopted as the Third Platoon motto. As told to me by his sister, Louise, "Mike was very easy-going, friendly and always happy-go-lucky. My sister, Phyllis, and I wanted him to go to Canada, but Mike would have none of that talk, saying that he was an American and would proudly serve his country. He was so positive that he would come back to us. In all his letters, he would never complain and would always end by saying, Ill see you next year ". On this fateful day, while on routine patrol, Mikes fire team was moved forward and Mike assumed point. A short while later, he exited a line of bamboo and tall grass into a clearing. After traversing the clearing for about 100 meters, he bent down to fill his canteen in a small stream. 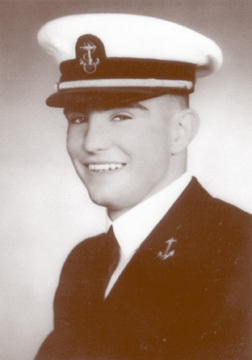 Immediately, automatic weapons fire from a well-planed ambush opened up and wounded Mike in the stomach. While he lay there, seriously wounded, the rest of his fire team sought cover and agonized on how to retrieve Mike. Two of them proceeded over a small dike and grabbed Mike by the arms, dragging him back to cover. Automatic fire hit both of Mikes would-be rescuers in the legs and one of the bullets pierced Mikes head, killing him. As the balance of the Third Platoon came to the aid of their comrades, a familiar battle cry could be heard by those who were pinned down  "Let It Ride". Mike was engaged to be married when he was killed. He was survived by his father and two sisters.